New Country Mercedes-Benz hosted the 2nd annual Rock Away Pancreatic Cancer event to benefit the Ron Foley Foundation. The dealership transformed into a night club for this fundraiser dedicated to helping CT families affected by one of the deadliest forms of cancer. 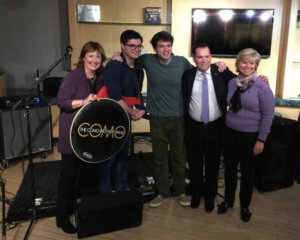 Over 120 guests came out to support the charity and enjoy a private concert by the COMO Brothers, a popular musical duo from Long Island! Toys for Tots at Toyota of Clifton Park!!! The Toyota of Clifton Park team participated in the Toys for Tots Campaign. With the help of our fantastic customers and teammates we were able to secure presents for kids in need. We want to thank and recognize a member of our team who went above and beyond (again) this holiday season. Liza Milo is one of our fantastic Service Advisors and led our team with this awesome initiative. There is still time to donate toys! 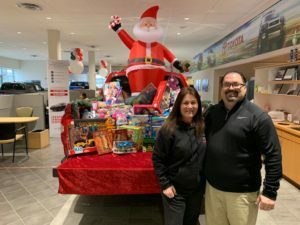 Feel free to stop by the dealership any time and drop off a toy! Happy Holidays from the team at Toyota of Clifton Park. Welcome to New Country Community, your source for news and local events by New Country Motor Car Group! With deep roots in the cities and towns where our car dealerships are located, we pride ourselves on a family atmosphere and strong customer bonds. After all, we are a family owned company with dealerships in NY, CT and FL! As a successful local business it is our pleasure to give back and connect on a personal level with you, our friends. New Country Motor Car Group is a caring and focused team of managers, service, sales, and support professionals. We enjoy participating in community events and charitable causes. If you are a local charity representative looking to partner with us please contact us directly. We encourage YOU to get involved with us! Select any of the charities you are interested in helping from our top right hand box "A Commitment to Caring"!